At Easterseals DuPage & Fox Valley, more than 1,000 children come through our doors each week. We believe in their abilities, help them achieve their goals and celebrate their progress every step of the way. With leading experts across specialties and diagnoses, Easterseals DuPage & Fox Valley is where families find clear answers and a community of support, so their children can realize their full potential. Our core services for infants and children include physical, occupational and speech therapies, while also offering leading assistive technology therapy, medical nutrition services, audiology, behavior therapy, developmental evaluations, social services, a child care center, specialty clinics, and a continuing education program. Learn More & Contact our Intake Coordinator at 630-282-2022 to ask questions or schedule an evaluation. As part of the Make the First Five Count campaign, Easterseals DuPage & Fox Valley is proud to offer a free online Ages and Stages Questionnaire (ASQ) for children birth to age five thanks to the generous support of CVS Health. 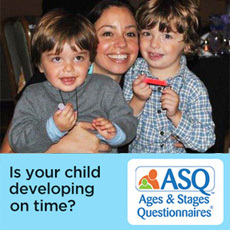 The ASQ will showcase your child's developmental milestones while uncovering any potential delays. Please note that milestones are continuous throughout a child's first five years of life. It is important to keep up with your child's progress by taking the ASQ every three months. The Lily Garden Child Care Center provides full-time and part-time, year-round child care to children of all abilities. We serve children, six weeks through six years of age, in a nurturing environment where they learn and grow together. Located in Villa Park, the Lily Garden is an outstanding child care center where children reach and surpass developmental and social milestones through a literacy and play-based curriculum. Our mission is to foster independence, compassion, knowledge and respect for all children. We are committed to providing an environment where all families are valued, supported and encouraged. We also foster appreciation for diversity and prepare all students for life in an inclusive society. Early Intervention services are provided by Easterseals therapists who are credentialed by the State of Illinois Early Intervention System. At Easterseals, children benefit from the knowledge of our entire team. Therapists collaborate and consult with all professionals involved in the child's care, in order to achieve the optimal outcome from therapy and to provide carryover and consistency across all environments. Contact our Intake Coordinator at 630.282.2022 to ask questions or schedule an evaluation.